If you are looking for a business opportunity in Indiana, you should consider trying what is in store for you in the world of BBQ and grill cleaning. You do not have to worry about how you can start. We are here to walk you through the entire process. You do not have to fret over the possible fact that you have no experience at all in the BBQ cleaning industry or feel so overwhelmed with the thought of how much money and time to invest. You do not need years of experience in BBQ and grill cleaning and a huge sum to start. We are not selling a franchise thus you can be sure that we do not charge monthly or annual royalty fees. Since we get plenty of requests for grill cleaning in Indiana but we have not reached out to everyone due to lack of people who can help us operate in this area, we will be more than glad to accept you as one of our operators. Work according to your schedule and charge fees depending on services you have rendered. As an established BBQ cleaning company, we can help your business grow here at The BBQ Cleaner. Why Start a BBQ Cleaning Business in Indiana? Weather is in Your Favor: Summers are long in Indiana. With this in mind, you can be sure that families will spend most of their time grilling outdoors. This is a perfect opportunity to offer grill cleaning services in the state. Plenty of BBQ Activities: During summers in Indiana, there are plenty of BBQ festivals that residents can choose to participate in. This means more customers for your business. Lesser Competitors: The BBQ grill and cleaning industry in Indiana is scarce. Only a few competitors exist in the area. Easy Scalability: Grow your business when needed. Just hire more staff and add more vehicles to help service the needs of residents in Indiana. How Does The BBQ Cleaner Help You Get Started in Indiana? This all-in-one package will help you get started with grill cleaning services. Add to that, we also give you access to our on-going lifetime business support here at The BBQ Cleaner so you can grow your business successfully. We have been in this business since 2009 and since then we have grown our number of operators with over 180 of them on our list to date. We have been recognized as a global leader in grill cleaning services thus assuring you that we can help maximize your full earning potential. 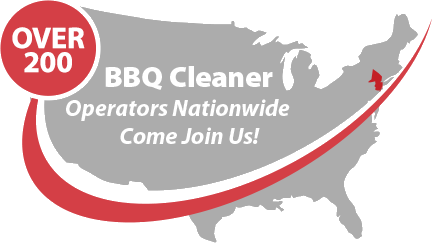 Talk to us today to find out more about this stellar BBQ cleaning business opportunity in Indiana!